There always seems to be one drain in the house that needs a little more work than the others. So every few weeks you find yourself trying to clear out a backed up drain. Have you ever worried about pouring harmful chemicals down the drain? How does that impact the health of your family? 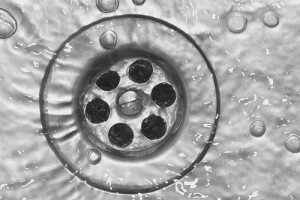 Increasingly we as homeowners are looking for green alternatives to the more traditional ways of handling things like a clogged drain. Most commercial drain cleaners contain dangerous chemicals such as lye or acid, and can ultimately affect our health, our wastewater stream, and the PVC pipes within our homes. The next time you have a clog, consider using a gentle yet effective approach to clearing a drain. There are many options, most of which can be found in your home, or on the shelves of your local health food store. Sometimes the best method is the simplest. Try an old fashioned plunger, and repeat several times to release the clog and free up the drain. If water hasn’t backed up into your sink, you can try a backing soda cleaner. Pour 1 cup of baking soda into the drain, followed by a few cups of boiling water. The boiling water creates an alkaline composition in the baking soda, which can clear out many of the toughest clogs. Repeat as necessary. When baking soda isn’t enough, try a mixture of vinegar and baking soda. Pour 1/2 cup baking soda down the drain, and follow it with 1/2 cup white vinegar. Cover the drain if possible. Let set for a few minutes. Pour a few cups of boiling water down the drain to flush out the clog. The vinegar/baking soda combination breaks down fatty acids into soap and glycerin, allowing the drain to run free. NOTE: do not use this method if any commercial drain opener has been used or is present in the sink or drain. If natural methods don’t work, it may be best to try a drain auger, or a plumbers snake. This can reach down to the clog, and pull it free for complete extraction. Still having problems? Your problem may be even deeper than you anticipated. Look for a green plumber in your area. He can provide powerful results while still providing the green results you are looking for.